Issued by The National Weather Service Medford, OR Fri, Dec 19, 4:08 am PST ... HIGH SURF ADVISORY REMAINS IN EFFECT FROM 11 AM THIS MORNING TO 10 PM PST SATURDAY... * WAVES AND SURF: SEAS PEAKING NEAR 20 FEET WILL CAUSE AVERAGE BREAKING WAVE HEIGHTS OF 20 TO 28 FEET IN THE SURF ZONE. * TIMING: LATE FRIDAY MORNING THROUGH LATE SATURDAY EVENING. WAVE HEIGHTS ARE EXPECTED TO PEAK AT WEST FACING BEACHES FRIDAY AFTERNOON AND EVENING. SOUTH GALES ARE LIKELY TO WORSEN BREAKING WAVE IMPACTS AT AND AROUND THE TIME OF HIGH TIDE AT SOUTH THROUGH WEST FACING PORTIONS OF THE COASTLINE AROUND MIDDAY ON SATURDAY. * IMPACTS: LARGE SURF WILL MAKE BEACHES AND JETTIES VERY DANGEROUS. WAVES OF THIS MAGNITUDE CAN EASILY SWEEP PEOPLE AND LARGE OBJECTS FROM JETTIES AND... POSSIBLY... INTO THE COLD OCEAN WATER. USE EXTREME CAUTION ALONG AND NEAR THE COAST... ESPECIALLY AT AND AROUND THE TIME OF HIGH TIDE. PRECAUTIONARY/PREPAREDNESS ACTIONS... A HIGH SURF ADVISORY MEANS THAT HIGH SURF WILL AFFECT BEACHES IN THE ADVISORY AREA... PRODUCING RIP CURRENTS AND LOCALIZED BEACH EROSION. SPA ROOMS $99.00 OCEAN VIEW WITH BALCONY $69. MUST TELL THE STAFF YOU SAW IT ON THE HUGE CAM PAGE! It's Official. The Inn of the Beachcomber has a rental fleet. Well also a demo fleet. We expect to sell most of these boards and relaod with the 2012's next winter. If you are thinking about a Standup Paddle Board give me a call. No sales tax, a great place to demo the boards and I will make you a deal you can't refuse. So come on over to the best sup Rental and sale center on the southern Oregon Coast. We are signed up with Starboard and Naish as a dealer and the boards are here. We have Demo Boards and Rental Boards including the 9' Hokua from Naish. We have nocked out so walls and are getting started on the SUP Board Shop. The Inn of the Beachcomber is the only Southern Oregon Coast Demo & Sales center. Check out theses awesome boards below. We have five Starboard and 6 Naish SUPs at the Inn. We are working on the details for the wetsuits and boots and We will be placing a new order for more boards. Had to get this one as a demo board for the Standup Showdown. Got a ton of feedback from the Paddlezone telling me to go for it. Diego saw this in the storage room and put it together. It already looks like it's seen some action and was the go to board for those contestants that wanted to try and keep up with Bernd, Zane and Kai. With the sport of stand-up paddling growing at a high speed, the development of performance SUP boards does not come to a stop. After setting the standard in short board style stand-up boards, we came up with two new designs that are poised to raise the existing standard. Both boards combine a single-concave entry section in the nose area with a double-concave center section leading into an accelerated V out the tail. The increased tail kick allows these shapes to release off the top effortlessly while the center V-section keeps the shape loose and easy to steer during the bottom turn. Unlike many other boards, the design of the 9'0" and 8'5" does not require you to shift body weight over the rocker as much, resulting in a shortboard-style riding. Both boards also feature a newly introduced deck concave, making balancing easier. The Nalu 11'4" AST is the high-performance sibling to the 11'6". 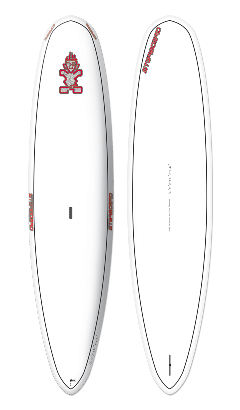 It is thinner and has more outline curve and rocker, with a single fin setup. The 11'4" provides excellent all-around riding performance and effortless longboard style rail-to-rail carving. Its volume-to-width ratio also make it an ideal beginner board for lighter riders. I bought this one for the rental fleet as my fantasy date this fall. The goal is to drop some pounds and get good enough to hit the surf zone in front of the Beachcomber. This board drops halfway into Starboards advance wave category and with a volume of 186 liters it offers enough float to keep anyone up if they know what they are doing. That the goal this summer. Starboards take on the 10' 5" 32" Widepoint. Its pulled-in nose and extra rocker prevents pearling in those situations where you left it a little late. Substantial amounts of tail kick provide the ability to maintain a surprising level of maneuverability that defies its large-board proportions. Easy on to waves, stable to ride, and easy to turn, characteristics that make it a good option for riders getting into SUP or heavier riders wanting to experience the waves. " I bought this one for the rental fleet for the experienced surfer/paddler that wants to step up and try a fairly high performance SUP. At 160 litters this is for the one with some experience in the surf zone. I added this on to the order in white ast to save some dollars yet be able to offer a great shape for the waves. An athletic gal will have a ton of fun on this board in the river. Starboard's take on the 10' 5" 30". Drive The outline has been brought in at the lifted nose and widened around the stance. This creates more outline curve making it more responsive, yet smooth through turns because of the addition of a fraction more V though the tail. The 2011 upgraded Drive retains all the classic characteristics which made it a favorite for being easy to ride, while paddling and on a wave. More than anything the Drive feels alive on a wave. "Mono concave nose section to flat middle with tail V"
Looking for a board that you can get out on the water and make some time? We picket this one up on the recommendation of Charlie Burwell at Naish. The 12' Glide is the smallest in the Naish lineup of race touring boards. This board is strictly for cruising the Rogue or for the more experienced rider a down winder to Pistol River. It has great volume so even the big guy can do some great exploring. I can't wait to try this one up at Lobster Creek Bridge on the Rogue. Bernd Roediger's take on the board. Another great all-around board in the Naish line. Perfect for the recreational paddler wanting to tour or drag race whether it be in flatwater or downwind with friends. Naish's description of the board. The Glide 12'0" utilizes design principles from the Glide 17'0" and 14'0". The shorter length makes it easy to maneuver, creating a great cruising board. The flat rocker makes it glide without effort, and its added width provides amazing stability. It's the perfect choice for flatwater adventures, cruising with friends, and recreational racing. I have no idea why the board manufactures do not make their 10' boards 9'11.5". 10' is the cut off for a vessel since the USCG ruling in 2008. In a swimming & surf zone no USCG PFD required on the navigable water ways with the other vessels, those with engines. I am figuring that this board will be popular for that reason alone. About the same float as the Starboard Wide Point but a full foot shorter and an inch wider. This board with its relative shorter profile should rip for the larger rider in the surf zone. I figure this will be my board of choice in the flatwater at the end of the summer for no other reason that I hate the government telling me what to do. Like they don�t have better things to do than writing tickets to paddlers on surfboards?. Naish's line Mana 9'5" AST The Mana 9'5" is the smaller sibling to the 10'0". It's an awesome first board for lighter riders in small surf or larger riders looking for superb wave performance with added float and stability. 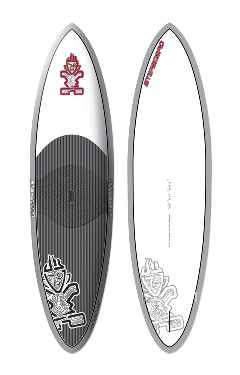 At 205 litters The Big Easy is a great all around SUP that will have a good amount of glide for the flat water. Narrower than the Avanti and longer. I added this on to the order in white ast to save some dollars yet be able to offer a great shape for crusing the Rogue River and the ocean. The Big Easy offers a great board for small waves. Starboard performance chart has it dipping down into the wave category on the maneuverability side and tipping into the race category for its gliding ability. Good volume for paddlers below 225 pounds. Starboards take on the 12' 0" 32" wide Big Easy. Stable to paddle thanks to its 32" width and great glide with the full 12'0" length. The generous nose width and mono concave up front provides fun nose riding abilities and also lets the board paddle into waves with ease. The pinned out alt section with ample tail rocker ensures good wave riding characteristics for a board of this size. A proven shape that has thousands of fans around the world. "Slight mono concave nose section to flat middle with a fair amount of V in the back" "Mono concave nose section to flat middle with tail V"
At 168 litters this is a great all around SUP for anyone. I added this on to the order in white ast to save some dollars yet be able to offer a great shape for the waves and offer an entry level windsurf board. With this versatility it's easy to see why the Whopper is one of Starboards sales leader. An athletic guy will have a ton of fun on this board in the waves and most any gal will feel like a pro in the river. Starboard's take on the 10' 34" wide Whopper Extremely stable at 34" wide, the Whopper provides stability to paddle through the most turbulent white water and other difficult conditions. Maneuvering the board is simple as it turns easily on the spot with its stability, making it a breeze to paddle into waves. 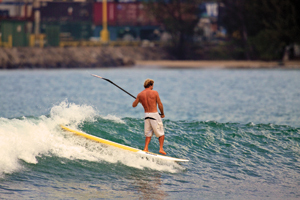 Almost impossible to nose-dive, it catches even the smallest waves with ease, making SUP even more fun. The Whopper continues to surprise with amazingly good wave riding characteristics for its width. To cement our place at the cutting edge of performance, Starboard has a high-paced development program. Only the very best of shapes continue for several seasons the Whopper is one of them. "Mono concave nose section to flat middle and tail V"
In general the Naish Stand Up Paddle Boards are narrower than the Starboard line up. This makes for a lot of diversity in our fleet. The Nalu 11' 6" is the same length as the Starboard Big Easy but is narrower and offers a lot more volume to float the larger paddler because of being almost an inch thicker. The Nalu 11'6" has the feel of a long board in the waves and with its ample volume narrow width is a great beginner board to venture out in the surf. Mana 10'0" Soft Top Featuring the same shape as the Mana 10'0" and Mana 10'0" AST the soft top/ slick bottom construction offers everything a beginner needs. The embossed deck area provides sufficient grip and is very skin friendly. The 3D rail protection makes this model resilient against damage caused by the paddle or any other hard objects. The slick bottom and soft fins provide additional safety for the rider and their surroundings. All of the protective features make the Mana 10'0" Soft Top the ideal choice for river runs as well.